This is from a deputation letter sent to the city of Toronto to voice my objection to the demolition of the Bridgepoint Half-Round building, one of the best examples of 1960’s architecture in Toronto, and the transfer of public parklands to a developer for condo and retail development. I am unable to attend the March 6, 2006, Administration Committee meeting to make a deputation in person. I request that the contents of this document to be entered into the record on my behalf. As a South Riverdale resident I am concerned about the possible demolition of the Bridgepoint Health building and as well as public land being transferred to Bridgepoint Health for condo and retail development. Additionally, I would like it to be made clear that I am not against a new hospital on the existing palatial site. 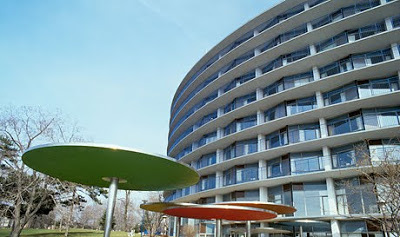 There will never be another building in our city like the Bridgepoint Half-Round. It is a one-of-a-kind, architecturally significant, sound structure and for these reasons should be saved. Historically the city of Toronto has been ignorant of the importance of our historical and otherwise significant architecture and has been terribly negligent in preserving it. We’ve got to change this before our buildings of significance are gone and we continue the slide into a generic, soulless, uninviting, pre-fabricated, shoddy, developer designed with only the bottom line in mind, city. My plea to save the Bridgepoint Half-Round is for the same reason that we place value in the arts. Things that are created with great skill and craft, that are daring and beautiful, that are of historical significance, that make us think and feel, inspire us both consciously and subconsciously every time we are in their presence; in the case of a city’s architecture it’s every time we leave our homes. By example these achievements encourage us to be and do our best. The architecture of our city is the environment in which we exist and therefore has tremendous importance in our lives. Consider that the world that we create for ourselves defines who we are and at the same time reflects who we are. Previous to moving to South Riverdale I lived in the Merchandise Building at 155 Dalhousie St, formerly the Sears warehouse. If that city block sized building can be converted into one of the most prestigious addresses in the city surely the Half-Round on the Don Valley with it’s dazzling city and sunset views can do the same. It is outrageous that public, taxpayer funded parkland is to be given to a developer in order to make a for profit condo and retail development. Please explain how provincial funding for a new hospital can be used for private development. It’s public land. Despite the rhetoric, the so-called public consultations have been a sham. This regularly played city council tactic has gotten old and must stop. Additionally, these meetings never included any information about a public land transfer. I am asking that you defer all approvals on these issues until the community has been truly consulted and considered.